When it comes to three dimensional objects, they are described through the use of three axes which intersect. In math we call these the x, y, and z axes. The areas in which two axes intersect create planes, the xy plane, the xz plane and the yz plane. 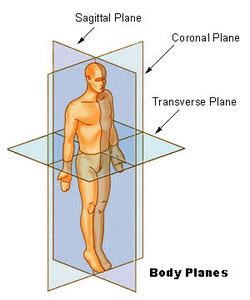 When it comes to the human body we describe these planes as the transverse plane, the coronal plane and the sagittal plane. Many of our dance movements can be described using these planes. For example: a horizontal hip circle moves along the transverse plane, vertical chest circle moves along the coronal plane, and a sagittal pelvic circle (or pelvic wheel) moves along the sagittal plane. The transverse plane runs parallel to the floor at any height on the body. We often refer to movements that move along the transverse plane as "horizontal" movements. So hip slides and rib slides both move along the transverse plane, so do rib cage arch and contract and even hip twists. The coronal plane is perpendicular to the floor and runs across the body from right to left. We often call movements that move along the coronal plane "vertical" movements or we say they are a "lift" or a "drop". Rib cage lifts and hip lifts both move along the coronal plane, as do vertical rib cage circles. The sagittal plane is also perpendicular to the floor but runs from front to back through the body. There is not a term in common every day language that is used to describe this direction, so I usually call such movements sagittal movements. Movements that move along the sagittal plane are bicycle hips and rib cage wheels. It is possible for a movement to move along two plans were they intersect. If a movement stays parallel to the floor but moves front to back, we usually consider it to be horizontal. A horizontal hip circle and a horizontal hip 8 both move along the transverse plane. The defining characteristic is we want the movement to stay parallel to the floor. While the moves both go front and back, and side to side they stay in a single transverse plane. By contrast vertical movements seem to stick to the coronal plane. Vertical chest circles and Mayas (vertical hip 8s) both move up and down and side to side along the coronal plane of the body. We often describe these movements as "standing between two panes of glass" or "standing in a narrow hallway" to indicate there should be no movement in the sagittal direction. Typically, we only describe a movement as being "sagittal" if it moves front and back and up and down. Shoulder rolls, bicycle hips, pelvic and rib cage wheels and full body undulations all move in the sagittal plane.